If you’d like to try out what cruising on Saga Sapphire is really like, at a price that’s too good to miss, Saga have just the thing…. Saga Sapphire follows Saga Cruises’ winning formula: a small ship just for grown ups, top-notch cuisine, inclusive value and superior service from friendly and welcoming staff. This ship harks back to the golden age of cruising, looking very much like a ‘proper’ ocean liner – epitomised by broad teak decks, large dining rooms and an elegant silhouette. If you’re tempted to experience this classic-meets-contemporary style of cruise but want to ‘try before you buy’ – now you can! On Thursday September 14, 2017, Saga are hosting a special overnight event in the port of Southampton. And although you won’t actually get to sail, you will get to try out what a day and night on this award-winning ship is like, as if you were really cruising to another fabulous destination. After arriving at Southampton early afternoon and being welcomed aboard, it’ll soon be time to indulge in that age-old cruising tradition of afternoon tea. Warm scones, delicate sandwiches, fresh cakes, cookies and a tempting array of other sweet treats mean it’s pretty hard to resist! Next, you might like to take a guided tour of the ship’s 12 decks, all packed with facilities, or why not grab a deck plan and explore yourself? It’s up to you. Other diversions to fill your day on board include the sumptuous Spa offering an array of treatments, enjoying a dip in one of the two pools, live entertainment in the Drawing Room, and relaxing at the Beach Club, designed to showcase the best of the British seaside. After the afternoon at leisure, you won’t want to miss the welcome cocktail party held in the Britannia Lounge. This is a prelude to the main event – a gourmet five-course dinner in one of the ship’s restaurants, served with free-flowing wines throughout. Then it’ll be time to choose your evening’s entertainment. A glitzy show in the main lounge, or live music and dancing in the panoramic Drawing Room are just two options. 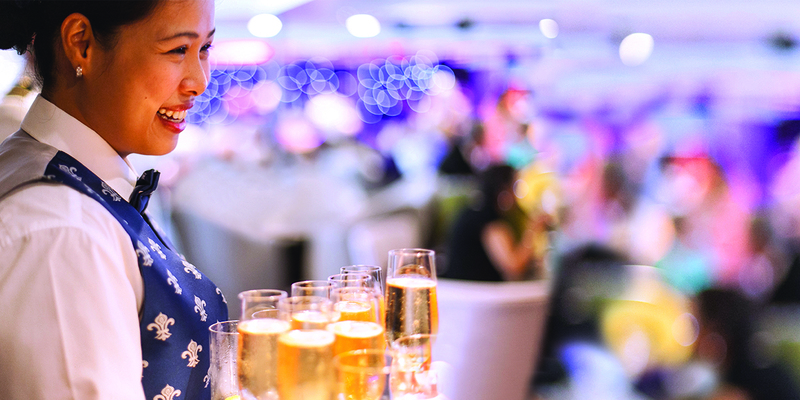 Or why not seek out one of the ship’s bars, and head to the outside decks for cocktails under the stars? And after all that, you can look forward to winding down, relaxing and enjoying a good night’s sleep in your cabin. Speaking of which, all of Saga Sapphire’s are exceptionally spacious for a cruise ship – at an average of 220 square feet, they’re much larger than the industry standard. Spaces on this one-off event are limited, and prices start from just £169 per person, including car parking at Southampton, afternoon tea, a cocktail party, dinner with a choice of wines, snacks, cabin accommodation, breakfast the following the morning, use of all the ship’s facilities including the gym, pools and complimentary WiFi, plus all gratuities and service charges. Cabins are selling fast, so call Saga’s UK-based consultants free on 0800 015 6983, quoting S149 and reserve yours today.